"Enjoy my familiar recipe. 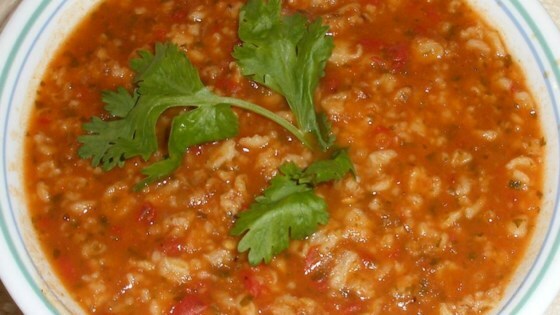 Delicious tomato and oats soup made with garlic and cilantro." Heat a large deep skillet or Dutch oven over medium-low heat. Pour in the olive oil, and let it heat up. Add the oats; cook and stir until toasted. In a blender or large food processor, combine the tomatoes, onion, garlic, 1 cup of water, and cilantro. Blend until smooth. Pour into the pan with the toasted oats. Stir in the remaining 2 cups of water, and bring to a boil. Mix in the salt and chicken bouillon. Cover, and simmer for 15 minutes. Enjoy hot or warm. This recipe is very similar to "Sour Cereal" with the exception of the chicken bouillion. I used to eat it for breakfast every day! I love this soup! And it is good for me (I spray the pan with pam and use only 1 Tbs oil). My husband even likes it. Wonderful, hearty, filling and guilt-free. I added the juice of two limes and black pepper and can hardly wait to try this with basil instead of cilantro. I blended in some bell peppers and added a a bit of chili sauce. Are the oats the rolled kind or the Scottish Oats kind? My veggie garden is going great and will have lots of cilantro and tomatoes to use!